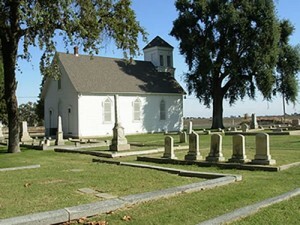 South of the town of Knight’s Landing off Road 113 sits Mary’s Chapel and Cemetery. The white church is stoic and plain with a narrow steeple that punctures the sky. The graveyard behind it has thick grass and ancient tombstones clustered by families.